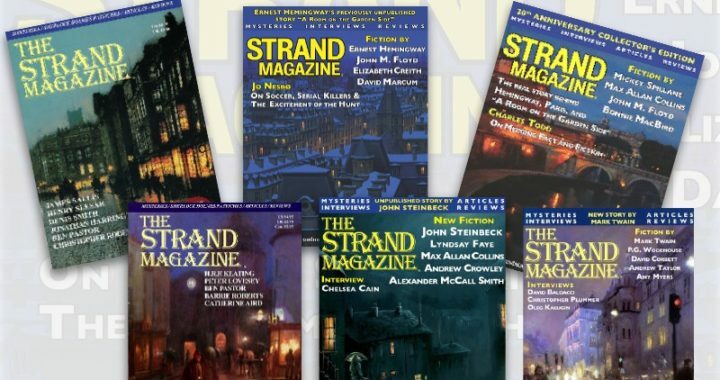 When the first issue of The Strand was released in fall of 1998, none of us had any idea we would still be doing this twenty years later. As with any new venture, nothing had prepared me or the team I’d assembled for the difficulties we encountered in getting that first issue published. More than once we missed deadlines we had set, and it wasn’t until many months after the original deadline that we were ready for press. We had a great editing team—though we were young and not that sure of ourselves. 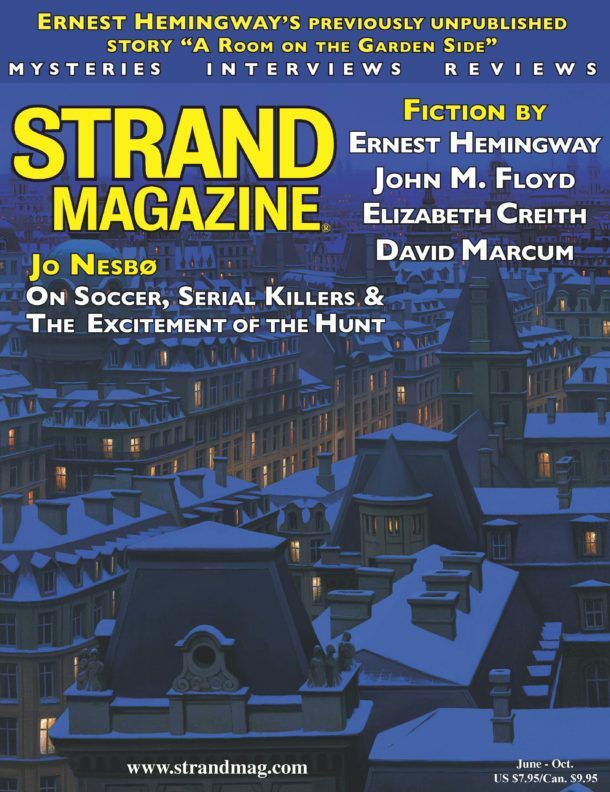 Our first issue had an interesting array of fiction, including stories by two great authors—James Sallis and Henry Slesar—as well as excellent articles and reviews. Unlike today, we had no interviews. Artists for the illustrations were the hardest to come by and, in addition to hiring a couple of freelancers, we included two drawings by one of my brothers—a surgeon who took his sketchbook to the hospital to draw between cases—and one sketch by yours truly. Everything was uncertain, and when we released the magazine into the world we had no idea what to expect. It wasn’t until phone calls started coming in from subscribers that we knew we’d gotten something right. In the two decades since, we’ve published new talent, established authors, and literary legends—including many of my own personal heroes (some living and some not). We’ve interviewed scores of world-famous authors, actors of great renown, and even a former Soviet spy. So there’s rarely been a dull moment. And as the deadline for each new issue approaches, and we’re hit with all the different problems that can arise when you’re dealing with circumstances (and people) beyond your control, I always remember an article I read, long before The Strand was a part of my life, by a former editor of a major US daily newspaper. The story explained that the TV show Murphy Brown’s portrayal of a newsroom lacked the “hysteria” of a real-life newsroom dealing with the pressures of real-life deadlines. At The Strand, we’re not reporting the news, but when the deadline is looming, and everything that can go wrong does go wrong, “hysteria” is a pretty good word to describe the atmosphere here. And then there are the appreciative phone calls and emails from the readers. Those conversations never get old. They are the reason the magazine is still going strong, twenty years later, despite all of the major shifts in publishing and the onslaught of e-readers and the digital age. 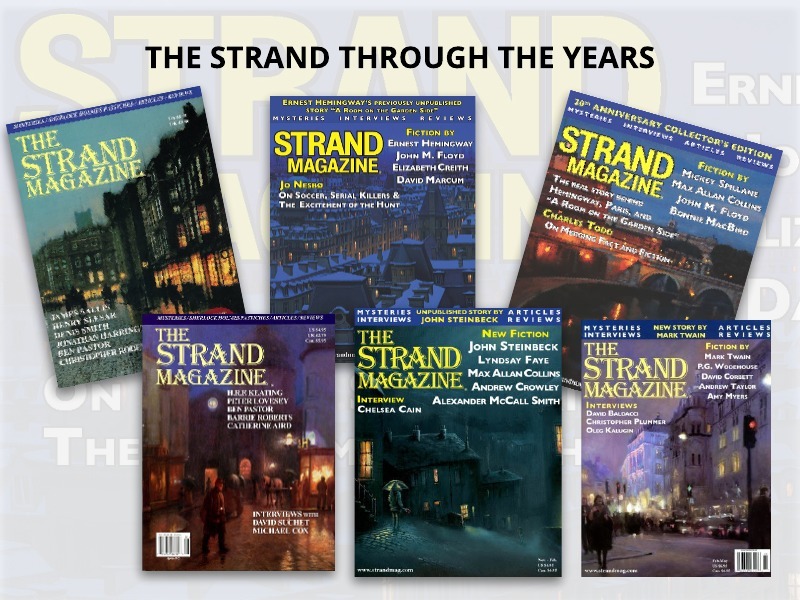 Also, The Strand wouldn’t have lasted this long without the loyalty of our advertisers, subscribers, vendors, and above all, our staff. We have one of the best fiction editors in the business, an excellent copy editor who doubles as a trusted adviser and researcher, and a team that has managed to consistently put out one great issue after the other. Our twentieth anniversary issue is no different, and we celebrate with a mix of friends old and new. Drawing on the notes left behind by the late, great Mickey Spillane, Max Allan Collins has Mike Hammer on a deeply personal case, a prequel of sorts called “Tonight, My Love.” John Floyd, in his eighteenth story for The Strand, sounds a cautionary note about snitching on a criminal in “Lucian’s Cadillac.” The multitalented writer, actor and producer Bonnie MacBird gives Lady Hilda—from the Arthur Conan Doyle story “The Adventure of the Second Stain”—a chance to explain herself in “Lady Hilda Revealed.” In “Milquetoast,” Olaf Kroneman shows how being a jerk can prove hazardous to one’s health. And David McVey’s “MacKenzie’s Artisan Ghost Train” will have you thinking twice about spooky amusement park attractions. 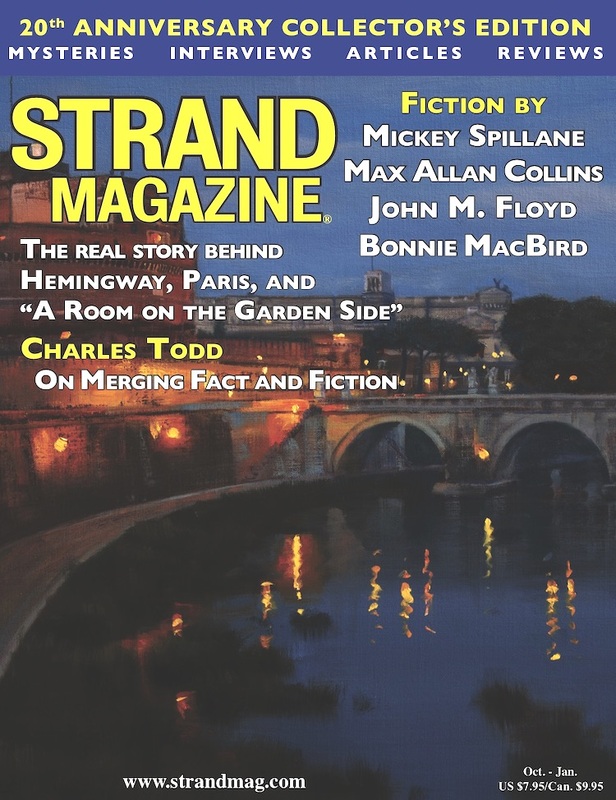 Also, Terry Mort gives us the scoop on the real-life events that led up to Ernest Hemingway’s World War II short story “A Room on the Garden Side,” published for the first time in the last issue of The Strand. And we have the distinct pleasure of sharing a conversation with the mother-son writing team Charles and Caroline Todd. This wonderful duo, better known as Charles Todd, has skillfully created a hugely successful sub-genre in the form of the World War I mystery.